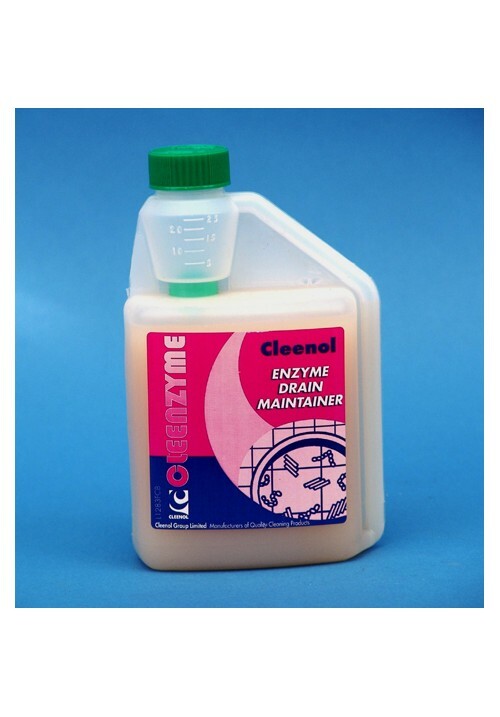 Cleenol Cleenzyme Enzyme drain maintainer - 500 Ml. Contains a specially selected blend of concentrated non-toxic natural microbes that effectively digest oils, fats, grease and other organic material blocking or impeding drainage systems or grease traps.Eliminate blockagesEliminate odours, the use of hazardous chemicals & the need for expensive rodding Provide an improved working environment Not affect drainage walls and bondings Significantly reduce BODs and CODs. The product is demonstrably more effective than conventional or enzyme-based drain cleaners as a biofilm is formed which produces a continuous and renewable supply of highly active enzymes for fat and grease degradation. This biofilm adheres to the drainage system walls and is highly resistant to cleaning fluids and disinfectants, thus providing a longer lasting protection than enzyme or caustic products which have minimal contact time.Built-in dosing cap for easy dispensing.This is a natural product. Its colour may vary and a small amount of sediment may be noticed. This is quite usual and does not affect the performance of the product. Cleenzyme Enzyme Drain Maintainer is supplied in concentrated form. Apply an initial dose of 25/50ml into the system, followed by a dose of 150ml per day. The dose should be introduced into the head of the drainage system or immediately before the main entry point of the organic waste.Manual applications should be carried out immediately before vacating the kitchen by mixing the product in approximately 5 litres of warm water and pouring down the appropriate sink.Automatic dispensing should be timed for one hour after kitchen shut down and injected directly into the line. Where possible, avoid direct use of concentrated disinfectants, bleaches, detergents and biocides, which may adversely affect the biofilm.Repeat daily for a period of 7 to 10 days.Reapply periodically, as and when the problem reoccurs.